Dr. Awesome and I had a great heirloom tomato salad at Rye the other night, so we decided to recreate the amazing experience. We went to the Tompkins Square Park Farmers Market and got some awesome heirloom tomatoes (finally! 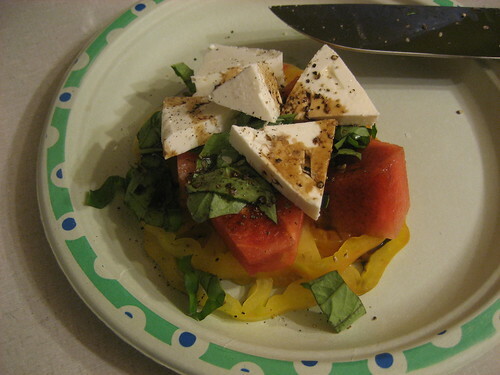 ), small watermelon and basil. I also picked up some barrel-aged feta from Whole Foods. Drizzle a little bit of balsamic vinegar with some salt and pepper and BAM – Awesome. *sigh* Have I mentioned how long I’ve been waiting for heirloom tomato season to start?? ~ by Rori on August 22, 2011.